With one semester completed under the Institute's three-year trial period with intermediate grading, students and faculty still offer no consensus. The experiment, proposed by the Committee on Academic Performance last year, allows faculty members to assign pluses and minus to letter grades that appear on internal grade reports. Intermediate grades will not appear on any official transcripts. The new system was designed to "allow everyone at the Institute to gain some experience with plus/minus grading, while seeking to alleviate the concerns of those worried about possibly increasing the pace and pressure and grade consciousness of our students," explained Professor of Civil and Environmental Engineering Nigel H.M. Wilson PhD '70, who chaired CAP last year. Although the new system was encouraged, course instructors were not required to give intermediate grades. Approximately 75 percent of courses utilized the plus/minus grading system last term, according to Professor of Aeronautics and Astronautics Paul A. Lagace PhD '78, chair of the committee on plus/minus grading. Many students feel that the intermediate grades will serve only to boost problems with competition and grade consciousness. "Competition is a good thing... [but] if it gets to be too great, it can be counter-productive," said Undergraduate Association Vice President Erik S. Balsley G. "If we are as we are always told - the best of the best - why must we be even further categorized into minute classes?" Some professors who oppose the new grading system chose not to assign plus/minus modifiers to letter grades last term. Professor of Electrical Engineering and Computer Science Alvin W. Drake SCD '57 belonged to this group. "It's an awful idea - there's no difficulty with the notion that this place is for exceptional people.... there's no need for finer distinction," Drake said. "The plus/minus grading will lead to more emphasis with evaluation than teaching," he said. In addition, some opponents are concerned that the new grading system will cause the alumni aid rate and the number of MIT applicants to drop. On the other hand, those who are in favor of the new system support that the plus/minus modifiers help better evaluate student performance. "I personally prefer it. It allows you to make finer distinctions with the grades more quantized and less jumpy," said CAP Chair Kerry A. Emanuel PhD '76, Director of Earth, Atmospheric and Planetary Sciences. Wilson said that the system would reduce the anxiety students feel when they just miss the grade cut-off mark. "The spread between a high B and low B has become very large in many subjects, and it inevitably results in students just missing an A feeling hard done by because of the large jump from B to A in terms of grade points," Wilson said. Some students feel that the change hasn't made much impact. "It hasn't made much of a difference to me.� I don't remember talking to anyone about their habits changing due to intermediate grades," said John S. Hollywood �96. The potential adverse effects on student performance due to the increased stress of intermediate grading were not visible. No significant effect was observed in last term's Grade Distribution Report, compared with the previous year. 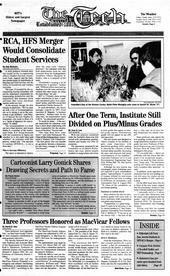 In Fall 1995, 55.8 percent of undergraduate and graduate student grades were As (including pluses and minuses), as compared to 54.6 percent in fall 1994; 36.5 percent were Bs versus 36.7 percent last year; and 7.7 percent were Cs compared with 8.7 percent last year. The grade experiment will continue until August 1998, said Lagace. "This is not a quick process. We're just starting to evaluate the system by gathering data to better formulate the effects." "I think the plus/minus system or some altered form will be permanent," Balsley said. "The three-year plan is a bridge to the inevitable decision much like pass/fail is the bridge to grades." "It's important for the faculty to keep an open mind, " Lagace said. "The greater resolution of the new system may prove to have the capability of better evaluating students' performance. It's good for us to question the things we do from time to time," he said.